Gas leak in Romema apartment leaves two dead. Firefighters evacuate building for fear of explosion. 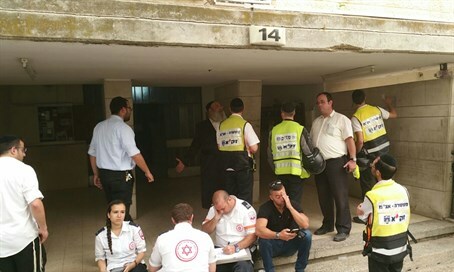 A man and woman, both about 50 years old, were found dead in a Jerusalem apartment this morning (Wednesday). First responders reported that the apartment smelled of gas. The incident occurred on Panim Meirot St, in the Romema neighborhood. Three teams of rescue workers arrived at 7:58 am, after receiving a report that lives were in danger. Firefighters forced their way inside and found the two victims. Noting that the high levels of gas could cause an explosion, emergency responders evacuated the entire building. They then aired out the apartment until it was deemed safe to enter again. Authorities are still on site in order to prevent further hazardous materials from causing harm. Walla! news reports that police initially suspected that the couple had intentionally committed suicide, but now believe they accidentally left the gas on.